For the first time in the Chinese Theatre's history, a couple of movie stars, married to one another, were imprinted at the same time on the same block. Robert Taylor's Technicolor film Billy the Kid for Metro-Goldwyn-Mayer had just opened, and so Taylor and his wife of two years, Barbara Stanwyck, were asked to make their imprints. Barbara Stanwyck in East Side, West Side (1949). 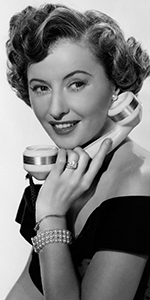 Barbara Stanwyck had one of the longest careers in films. Starring in pictures by age 25, she was nominated for the Best Actress Oscar four times, and had a great career in television. Stanny is one of the greats. Born into a large working class family, Ruby's mother died when she was four. After the funeral, her father ran off, never to be seen again. She lived for a time with her much older sister Mildred, who eventually got a job as a showgirl; Ruby was placed in foster homes, some of which she ran away from. Eventually touring with Mildred, Ruby saw the films of Pearl White and decided to become a film performer. At age 14, she dropped out of school and held various odd jobs: shipping clerk, data entry, dress pattern cutter. Finally, at 16, she got a job in the chorus at the Strand Roof nightclub in New York. In the 1922-1923 season, she danced in the Ziegfeld Follies at the New Amsterdam Theatre. She worked for several years as a chrorine for legendary nightclub owner Texas Guinan, where she became pals with pianist Oscar Levant. In 1926, Ruby was cast to play — a chorus girl — in a play called The Noose. The play flopped in tryouts, but it was decided to expand and deepen Ruby's role. She rose to the challenge. When it opened on Broadway, The Noose ran for nine months. She took two names from characters in the play and assumed them for herself: Barbara Stanwyck. In 1927, Stanwyck was cast in the lead of Burlesque on Broadway. The play was a great success, so offers from the Hollywood studios began coming in; she flunked her first screen test, but moved to Hollywood with her first husband, actor Frank Fay. Stanwyck's first picture was The Locked Door (released in November, 1929), which drew the attention of director Frank Capra, who put her in his film Ladies of Leisure (released in April, 1930). Now, Stanwyck was on a roll: She had the lead in the second filming of Edna Feber's popular novel So Big! (released in April, 1932). After this, Stanwyck found herself terribly busy while her husband Frank Fay's career took a tailspin. Their story is widely thought to have insiped the story for the film A Star Is Born (which played the Chinese in April, 1937). Divorcing Fay in 1935, she met actor Robert Taylor on the film His Brother's Wife (which played the Chinese in August, 1936), and married him in 1939. Standwyck delighted audiences in both dramas and comedy: Stella Dallas (released in August, 1937), Union Pacific (released in May, 1939), The Lady Eve (released in March, 1941), Meet John Doe (released in May, 1941), Ball of Fire (released in January, 1942), Double Indemnity (which played the Chinese in August, 1944), Christmas in Connecticut (released in August, 1945) and Sorry, Wrong Number (released in September, 1948) and Titanic (which played the Chinese in April, 1953). Transitioning to television, she received an Emmy for The Barbara Stanwyck Show on NBC in 1961, but the show tanked in the ratings. She took a role in the western Wagon Train on NBC and ABC in 1961-1964, then went on to The Big Valley from from 1965 to 1969 on ABC, and bagged another Emmy. She appeared on The Untouchables (1962-63), and got a third Emmy for her role in the mini-series The Thorn Birds on ABC in 1983. Stanwyck divorced Taylor in 1952, although she remained close; upon his death in 1969, she took some time off from film work. When their cement block at the Chinese began to crumble, Mann Theatre executives offered to have her re-do it in the late 1980s, but she declined, since doing so would have exclued Taylor. A life-long smoker, Stanwyck died of congestive heart failure in 1990 at the age of 82. 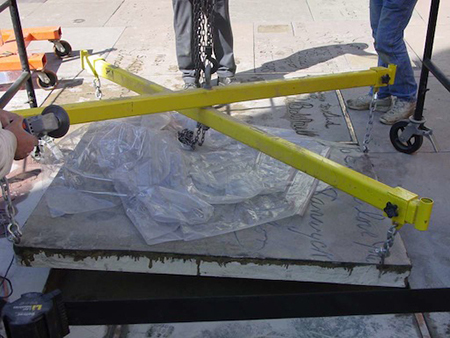 Her block with Taylor was removed and underwent a nine-month restoration; then it was returned to the Forecourt on Monday, March 6, 2003. Robert Taylor was a popular leading man of the latter 1930s, 40s, and 50s. His manly presence in literally any sort of film kept him very busy, eventually becoming a voice in conservative politics during the Blacklist era. Born the only child of a farmer / doctor and his wife, the Brugh's moved about when Spangler was young, but settled in Beatrice, Nebraska. The strapping young fellow was good at track, and studied the cello. When his cello professor took a job at Pomona College in California, Spangler made the move to continue his studies. He got into the college theatre, where he was spotted by a Metro-Goldwyn-Mayer talent scout in 1932. M-G-M changed his name to Robert Taylor and loaned him to Fox for the 1934 comedy Handy Andy with Will Rogers. Actress Irene Dunne selected him to play opposite him in Magnificent Obsession (released in December, 1935). He was paired with Barbara Stanwyck in His Brother's Wife (which played the Chinese in August, 1936). He then played opposite Greta Garbo in Camille (played the Chinese in January, 1937). Taylor did the heavy lifting. He was in musicals, like Broadway Melody of 1938 (which played the Chinese in August, 1937), and comedies like A Yank at Oxford (played the Chinese in February, 1938), and dramas like Waterloo Bridge (played in May, 1940). Westerns, too. He played the title role in Billy the Kid when that film played the Chinese in June, 1941, where he and now wife Barbara Stanwyck were asked to make their imprints together. After making the war film Bataan (which played the Chinese in June, 1943), Taylor joined the U.S. Naval Corps, where he participated in the documentary The Fighting Lady (which played the Chinese in December, 1944). After the war, Taylor had his share of roles in film noirs: Undercurrent (released in January, 1947), High Wall (released in 1949), and Conspirator (released in March, 1950). His turn in the epic Quo Vadis (released in December, 1951), introduced him to the historical epics: Ivanhoe (released in February, 1953), Knights of the Round Table (released in January, 1954), and Valley of the Kings (released in July, 1954). By this time, Taylor and Stanwyck had divorced, with Taylor buying a huge ranch in Brentwood, where he lived with his new wife actress Ursula Thiess, and he entered a period of making westerns: Many Rivers to Cross (released in February, 1955), and The Law and Jake Wade (released in June, 1958). 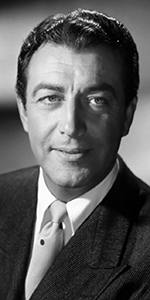 Leaving M-G-M in 1958, Taylor formed his own production company and got The Detectives with Robert Taylor to air on ABC from 1959 to 1962. He re-teamed up with Barbara Stanwyck for The Night Walker (released in March, 1964), then took obver as the narrator on the television show Death Valley Days (in syndication from 1966 to 1969). A life-long heavy smoker, Taylor was found to have lung cancer; he gave up smoking to fight the desease. He seccumed in June, 1969 at the age of 57. Grauman's Chinese Theatre, Hollywood, California. Barbara Stanwyck / Robert Taylor Forecourt ceremony, Wednesday, June 11, 1941. 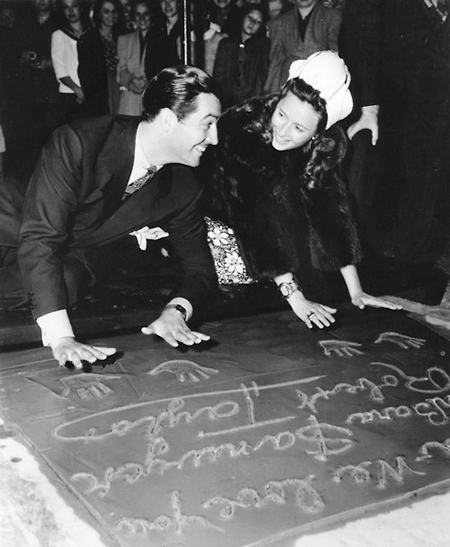 Robert Taylor and Barbara Stanwyck pause after placing their handprints in the cement. Grauman's Chinese Theatre, Hollywood, California. Installation of restored Stanwyck / Taylor block on Monday, March 6, 2003. Photo by Scott Michaels, courtesy of www.dearlydepartedtours.com.